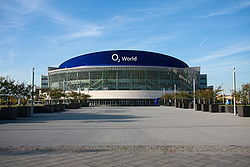 It cost 90 Euros for what looked like a good seat in the O2 World in Berlin (29 October 2011). Okay, I didn’t expect too much of a view, but I did expect a large screen to help me to see the man on stage. Actually, he and his band arrived on stage all dressed alike. It took us two songs finally to identify him. Not once did he address us as an audience; nor did we get an encore. Okay, I’m not a great fan of Bob Dylan, but I was prepared to try. His band were excellent. However, was it a state of the art venue with pristine sound quality? No. Wretched. I couldn’t hear a thing from Bob Dylan or his support act, Mark Knopfler. Great venue if if you want to get mugged; in addition to the ticket, a bottle of Becks will set you back 4 Euros. Dreadful place. Dreadful gig.